Traditionally, a 'dhimmi' in Islam is a Jew or Christian who agrees to live under the authority of an Islamic state, agreeing to pay a 'jizya' (poll tax) and enduring a number of discriminatory conditions in return for 'protection' from the state. The Qur'anic basis for this arrangement is 9:29. In practice of course, the dhimmi pact, far from being a model of historical multiculturalism and tolerance as hailed by Western Islamic apologists such as Karen Armstrong, is actually equivalent to Mafia racketeering, as failure to pay 'jizya', whose financial burdens often proved heavy historically, leads to a loss of 'protection' by the state. For the Islamic State of Iraq and ash-Sham (ISIS), which has the backing of broad elements of classical Islamic theology in this regard, such a development comes as no surprise, as the group's predecessors- Islamic State of Iraq (ISI) and al-Qa'ida in Iraq- similarly imposed jizya on Christians both in the Baghdad area (al-Dura neighborhood) and the north of the country. In Syria, the group has already imposed dhimmi terms in practice on Christians in Raqqa province, such as in Tel Abyad, where supposed violation of the dhimmi pact was the pretext for ISIS' desecration of the Armenian church in the fall of last year. One should also note that this pact has been imposed by ISIS' leader Abu Bakr al-Baghdadi and bears his signature as the amir al-mu'mineen ("Commander of the Faithful"- the traditional title of a Caliph, illustrating how ISIS is aiming to build the Caliphate and is projecting its leader as the future Caliph). 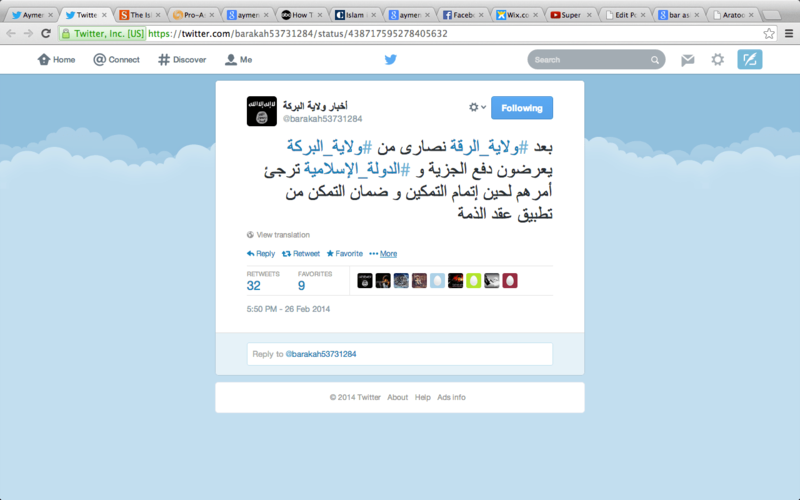 It would thus indicate that Baghdadi is likely to be in Raqqa province at the moment. Indeed, such a conclusion on Baghdadi's location is quite logical, for I would also note how my ISIS contacts within Raqqa province have been referring to Raqqa city in particular as ISIS' 'capital' since ISIS took over the city and most of the rest of the province, with the exception of a Kurdish enclave just west of Tel Abyad and two regime airbases (Brigade 17 and Tabqa military airport). Meanwhile, Liwa Thuwar al-Raqqa, FSA-banner groupings, and some Jabhat al-Nusra continue to wage an underground insurgency with sabotage attacks (which are also happening in other ISIS strongholds such as Manbij in Aleppo province), and an underground regime presence, which has existed since Raqqa province largely fell into rebel hands, is beginning to flaunt its presence in the city of Raqqa, for a Raqqa branch of the National Defence Force (NDF) has recently been proclaimed, giving news of raisings of regime flags and displays of pro-Assad graffiti in Raqqa. 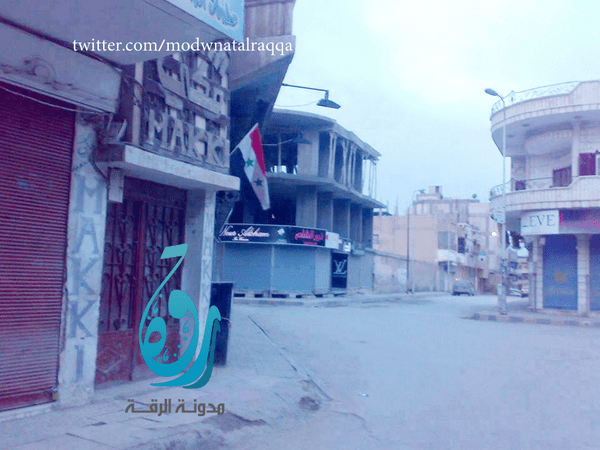 Figure 1: Regime flag recently put up in Raqqa city. Text of the pact of security the Islamic State has given to the Christians of Raqqa with their embracing the rulings of dhimma. Fight those who believe not in God, nor the Last Day, nor in what God and His messenger have forbidden, nor adopt the true religion [Islam], [even if they be] from the People of the Book [Jews and Christians], until they pay jizya with the hand, and feel themselves subdued- Qur'an 9:29. We bear witness that there is no deity but God alone. He has fulfilled his promise. He has given victory to His servant. He has made mighty His soldiers. He has defeated the parties on His own: there is no deity but God whom we worship, having purified religion for Him even if the kuffar hate it. And we bear witness that Muhammad is His servant and messenger- may God's peace and blessings be upon him…and we bear witness that Jesus the son of Mary is God's servant and His messenger…the Almighty has said: 'Never would the Messiah disdain to be God's servant, and nor would the Angels who are near, and whosoever disdains to worship Him and is haughty- He will gather them to Himself together'- Qur'an 4:172. And for what follows: This is what the servant of God- Abu Bakr al-Baghdadi, the Commander of the Faithful [NB: this is the title of a Caliph] has given to the Christians concerning the pact of protection. He has given them security for themselves, their wealth, their churches and the rest of their property in the province of Raqqa: their churches should not be attacked, nor should anything be taken [by force] from them, nor from their domain, nor anything from their wealth, and there should be no compulsion against them in religion, and none of them should be harmed. 1. That they must not build in their town or the periphery a monastery, church or monk's hermitage, and must not rebuild what has fallen into disrepair. 2. That they must not show the cross or any of their scriptures in any of the roads or markets of the Muslims and they must not use any means to amplify their voices during their calls to prayers or similarly for the rest of their acts of worship. 3. That they must not make Muslims hear recital of their scriptures or the sounds of their bells, even if they strike them within their churches. 4. That they must not engage in any acts of hostility against the Islamic State, like giving housing to spies and those wanted for a reason by the Islamic State, or whosoever's brigandery is proven from among the Christians or others, they must not aid such persons in concealing or moving them or other such things. If they know of a conspiracy againt the Muslims, they must inform them about it. 5. That they must not engage in any displays of worship outside the churches. 6. That they must not stop any of the Christians from embracing Islam if he so wishes. 7. That they must respect Islam and Muslims, and not disparage their religion in any way. 8. The Christians must embrace payment of the jizya- on every adult male: its value is 4 dinars of gold…on the Ahl al-Ghina [the wealthy], and half that value on those of middle income, and half that on the poor among them, on condition that they do not conceal anything from us regarding their state of affairs. And they are to make two payments per year. 9. They are not allowed to bear arms. 10. They are not to deal in selling pork and wine with Muslims or in their markets; and they are not to consume it [wine] publicly- that is, in any public places. 11. They should have their own tombs, as is custom. 12. That they must accept the precepts imposed by the Islamic State like modesty of dress, selling, buying and other things. So for them is nearness to God and the dhimma of Muhammad, the Prophet and Messenger of God- may God's peace and blessings be upon him- even as God brings his command: what they have embraced in the conditions outlined in this document. But if they disagree with anything in this pact, then they have no dhimma, and the Islamic State of Iraq and ash-Sham will deal with them as it deals with the people of war and stubborn enmity." Update: After the implementation of this dhimmi pact in Raqqa province, the practice looks set to spread to Hasakah province (Wilayat al-Baraka in ISIS terminology), where ISIS is the dominant force in rebel-held areas. A Twitter account associated with ISIS news from Hasakah province- @barakah53731284- says "After Raqqa province, Christians from Baraka province offer to pay jizya and the Islamic State postpones their matter until it can be made completely possible with a guarantee of being able to implement the dhimmi pact." Update 2: In case ISIS' ambitions to a global caliphate were still not apparent to anyone, ISIS' official Twitter account for Raqqa province had this to say on the imposition of the dhimmi pact: "Today in Raqqa and tomorrow in Rome." Rome is traditionally seen as the Christians' global capital.